Did you hear?!? 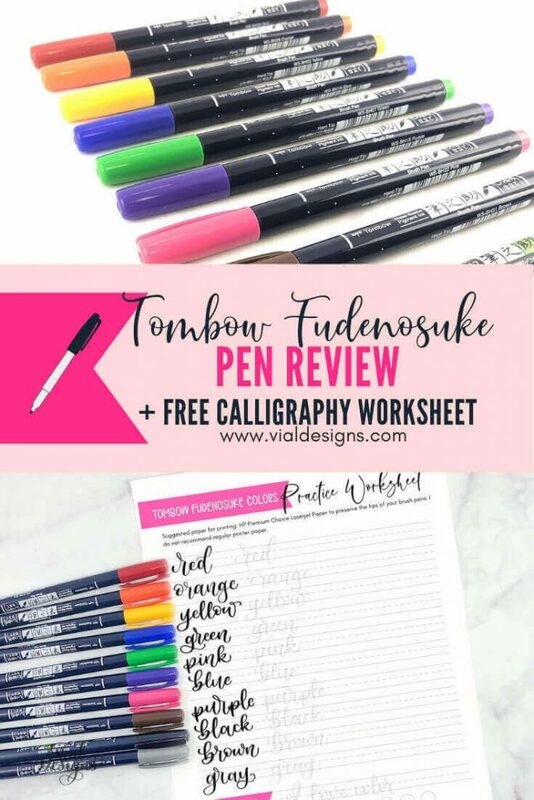 The Tombow Fudenosuke Colors are here! Well, they got out in the world last September. But I’m finally getting around to do a review, and I’m ready to tell you ALL about them. Whether you’ve been practicing brush calligraphy for a while or you’re just starting, you’d want to know about these pens. So, read on! The Tombow fudenosuke soft and hard tips were the first ones I got my hands on when I first started learning calligraphy. They are my ALL-TIME-favorite pens and the ones I recommend for beginners. If you have been lettering for a little while you know that the only thing missing from the Tombow Fudenosuke family, was that they didn’t have color options! Back when I wrote that blog post about the best brush calligraphy pens, that was the only con I saw on them. I’m SO happy Tombow USA listened to its customers and introduced colors to the already amazing Tombow Fudenosuke brush pens. Tombow is one of my favorite pen companies. I love following them on social media. And I appreciate how they interact with their customers and how they care about their product. I own most (if not all) of their products because they are THAT good for calligraphy, lettering, journaling, and everything in between. No, this is not an ad, and I’m NOT an affiliate. I believe in their products, and that’s why I love sharing them. Although, I wouldn’t mind working for them or being an affiliate (*cough *cough, Tombow? Are you listening?). Okay, now that I’ve put my intentions out in the universe, it’s time to get back to the review. Best part? 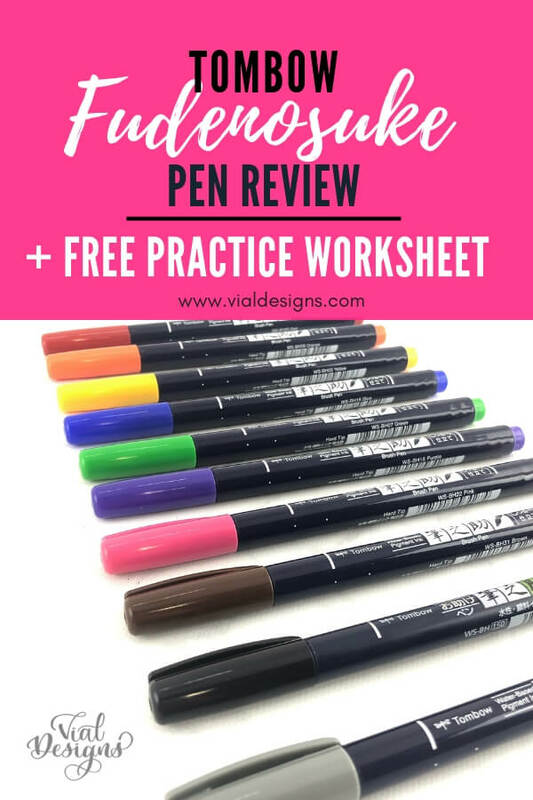 I created a Free Calligraphy Practice Worksheet to go along with this post, and I’ll show how you can have access to it at the end of this blog post. I got the Tombow Fudenosuke Colors on Tombow’s September VIP box. You can get these pens on Amazon here or directly from Tombow here. Tombow VIP boxes feature an assortment of Tombow products. Each box includes exclusive and newly released items as well as some of their best selling and traditional products. One thing I like about this box is that it’s a one-time purchase. It’s not subscription based, so won’t have any recruiting charges. AND no hassle trying to cancel. Another good thing is that you know what’s included on the box before you order it. When it was announced that the September VIP Box edition included the new release of the Tombow Fudenosuke Colors, I HAD to have it. 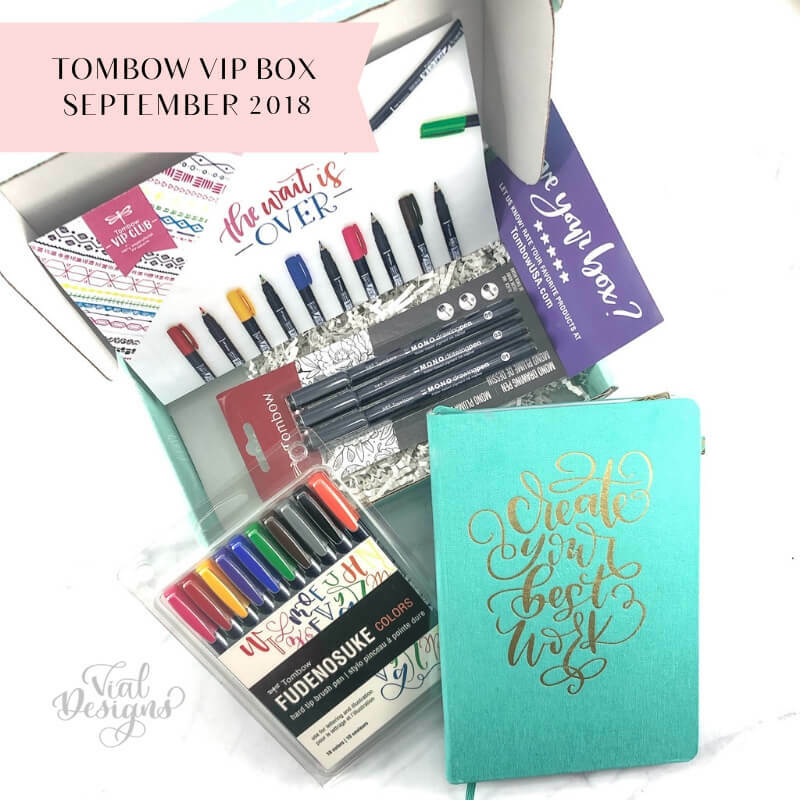 Would you be interested in a review on the Tombow VIP box? Let me know in the comments. After trying these babies out for a little bit, here is MY HONEST review of these pens. They have a flexible hard brush tip, which allows a smooth transition between strokes by changing pen pressure. Light pressure for upstrokes, heavy pressure for downstrokes. This feature makes these pens perfect for calligraphy, lettering, and other illustration projects. They come in 10 colors: the good old back Black, Gray, Red, Orange, Yellow, Green, Blue, Purple, Pink, and Brown. They are water-based, which helps avoid the bleeding through most papers. Odorless: This is a plus for me. I use these pens daily and wouldn’t want to have a strong odor on them. They are non-refillable. I don’t think this is a big issue because these brush pens last a long time. They are SO smooth to write. This is one of my favorite things about these pens. They write like butter! You’ll get great thin upstrokes with these pens and perfect downstrokes. Great pens for beginners: as I mentioned before, the Tombow fudenosuke hard and soft tip brush pens are my most recommended pens for beginners. The hard tip was my favorite starting out, and it still is. Check this blog post for my top brush pen recommendations for beginners. 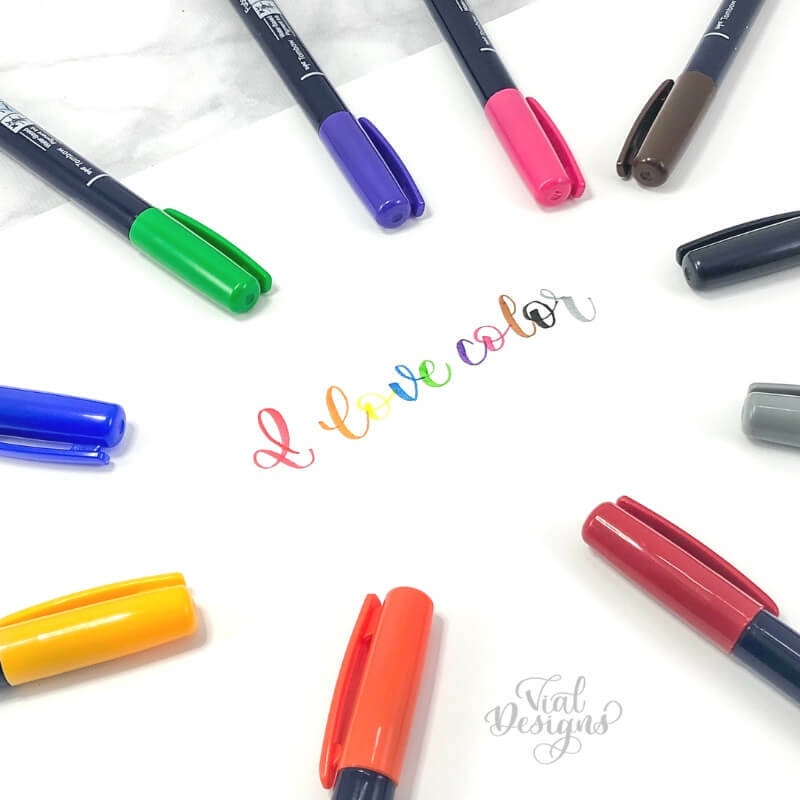 In the blog post, I share all the reasons why I recommend those pens for beginners, so I’m not going into much detail here. Portable & Comfortable: these pens are the same size as regular pens, so you can store them easily and carry them with you. Unlike the Tombow Dual Brush pens that usually don’t fit on regular size pouches. This means you can take them with you everywhere and sneak some calligraphy practice as much as you can. They fit just right on your hand. Odorless and don’t bleed through: This feature makes the Tombow Fudenosuke Colors perfect for bullet journaling. I used these pens in my bullet journal daily. I love that they don’t bleed through and I don’t have to smell anything weird every time I write in my bullet journal. This is a big plus for me. If you are getting these babies (or already have them) and want to get your practice on, fill out the form at the end of this blog post to gain access to the FREE calligraphy practice sheet shown on the picture below. 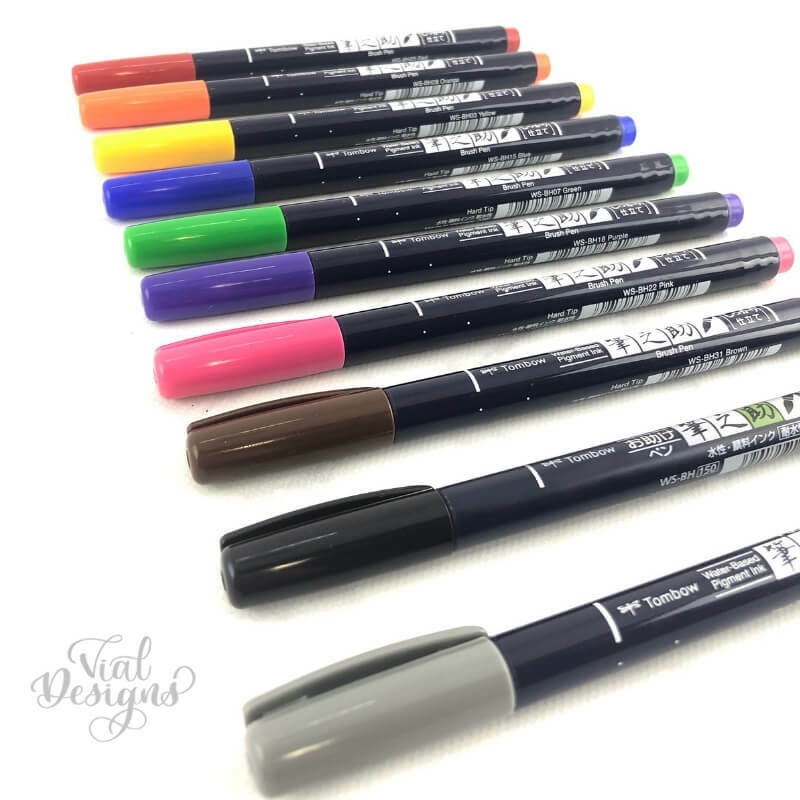 Okay, everything is ALMOST perfect with these pens, but since this is MY honest review, I have to share a couple of things that I wish were a little different when it comes to the Tombow Fudenosuke Colors. Vibrancy: These pens are vibrant, but honestly, I was expecting the colors to be as vibrant as the Tombow Dual Brush Pens. When I compared these colors to their Dual brush pens, I think they are on the softer side on vibrancy. The caps look super vibrant, but the colors when you write are not as vibrant. If I compare these brush pens to other small brush pens like the Pentel Fude Brush pens, you can see the difference in the color vibrancy. The range of Colors: I know, I wanted colors. I GOT colors. What more do you want? Well, I want more colors! Haha. GIMME ALL THE COLORS! (I hope I’m not the only one) I mean after having over 100 color options on their Tombow Dual Brush pens, a girl can dream of having her Tombow Fudenosuke in more colors, right? Are they affordable and worth the investment? These pens are a little bit on the expensive side currently about USD 25 for the packet of 10. I still think they are worth the investment because they have such high quality and will last for a long time. Are these pens good for beginners? As I mentioned before, the Tombow Fudenosuke Pens are what I recommend for people who want to start calligraphy. The great thing about these newly release pens is that you now have more colors to choose from. In the past, there were only black and gray fudenosukes. If you are not ready to invest in these pens, but still want to learn calligraphy, I have GREAT news for you. All you need to start learning calligraphy is pen and paper. 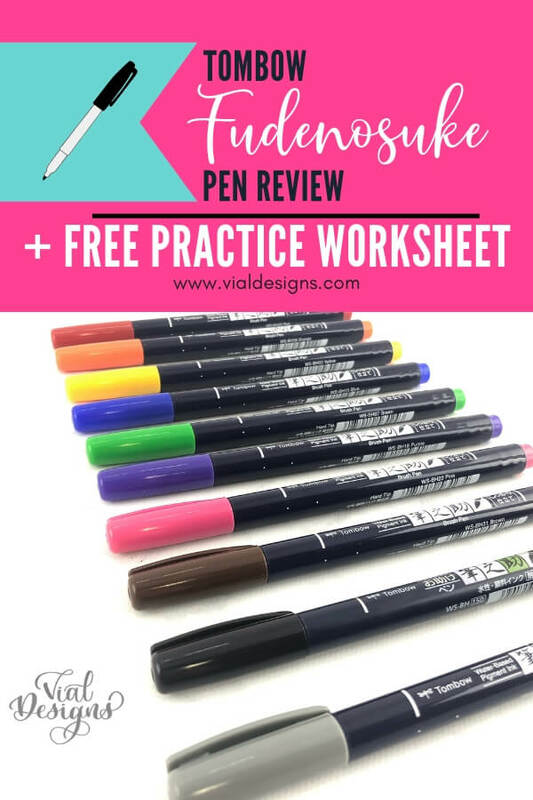 In this blog post, I show you exactly how you can learn calligraphy using regular pen and paper, AND I give you a FREE calligraphy worksheet to get started with your practice. Win-win! I legit made a happy dance when Instagram was going crazy because the Tombow Fudenosuke Colors were FINALLY coming out. I love that they are hard-tip, they are waterbased, durable, and odorless. I’m my opinion, all the great things about these pens outweighs the cons, and I’ll be using them for a long time to come. WANT TO REMEMBER THIS FOR LATER? SAVE THIS YOUR FAVORITE PINTEREST BOARD! I hope you enjoyed this review and don’t hesitate to ask any questions you might still have. 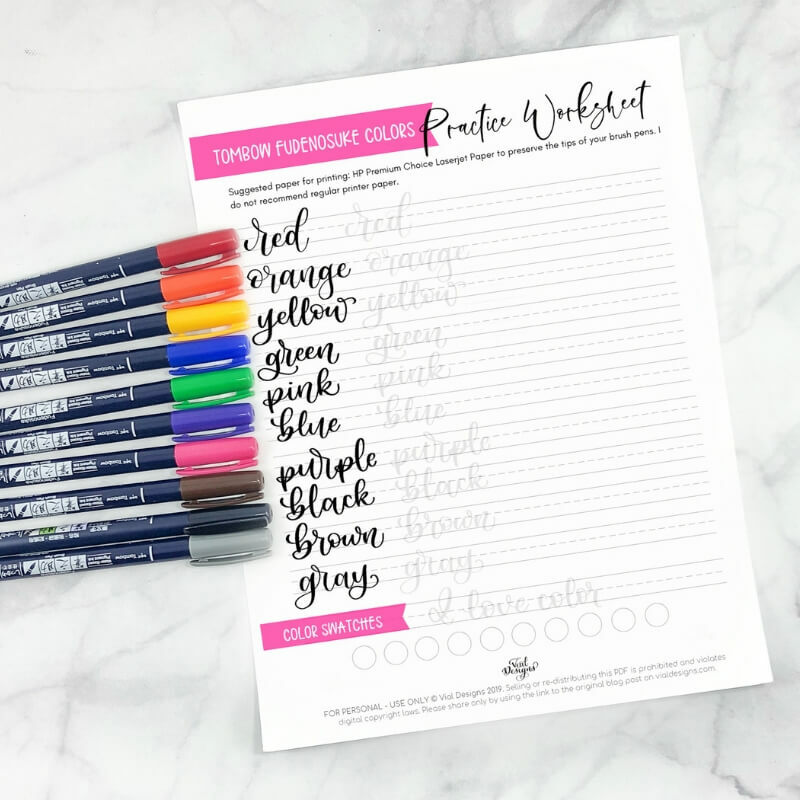 If you want access to the FREE Calligraphy Practice Worksheet that goes along with this blog post, fill out the form below to get instant access to it. 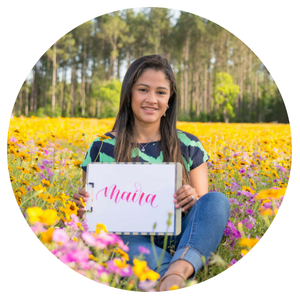 I’d love to see you practicing and how you use your Free Calligraphy Worksheet. Use the hashtag #vd_tutorials or #vialdesigns_blog. Don’t forget to tag me on @VialDesigns (on Instagram) or Vial Designs Studio (on Facebook) so I can see your work. Wow I looked at the video you write so that it look if it is easy but do you hold the pen at an angle to get the thickness. Thank you so much, Lida! And yes, in calligraphy holding the pen at an angle is very important to get the strokes right.